Termites are threatening to your home and can cause serious damage if not resolved. Termites feed on the wood foundation within the house. This means they can spread throughout your home leading to more money for repairs. If the termites spread throughout the home, unnoticed for a long period of time, the damage may be irreparable. Finding the termites themselves may be hard due to their size and ability to hide within the wood. For signs of termite infestation read more here. The most commonly used removal method for termites is extinguishing with a liquid treatment referred to as termiticide. This liquid is poured around the infested area, as well as other areas of he home and under the housing foundations. An eco-friendly alternative to termiticide is a more successful method called bait treatment. During this bait treatment stakes containing wood is placed around the home. Once the termites are attracted to this bait, a chemical is placed around the area. This slow acting poison is carried back by the termites to the colony where it eventually kills them all. Borate wood treatment is a preventive method used by treating the wood beforehand. If the termites do get into the home the chemicals kill the termites before they burrow into the wood. Termites can cause an extreme amount of damage to your home that can cost you a lot of money. Even though termites primarily feed off of wood they also like paper, books, insulation, and even sometimes swimming pool liners and filtration systems. If you know, homeowner’s insurance does not cover any termite damage. It is best to look into a termite control company to prevent them from coming back or the damage getting worse. Remember when buying or selling a home to get a termite inspection on the home first. How to determine you have a termite infestation make sure to keep an eye out little winged bugs inside of your home. Make sure not to confuse these with ants, as most people often do. You may also notice mud tunneling in specific areas of your home. Lastly, if you notice any sudden wood damage in your home. If the wood is easily bendable or breakable, these are all common signs of a termite infestation inside of your home. Your best best to get rid of a termite infestation inside of your home is to leave it to a termite control company. 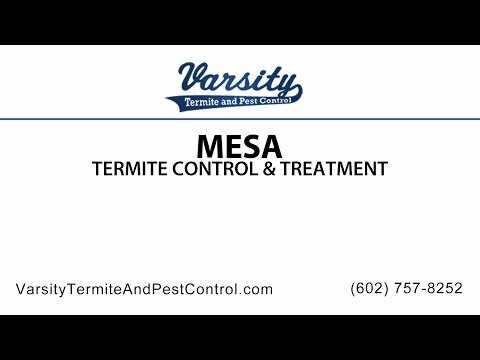 Contact Varsity Termite and Pest Control today for an inspection and our professional team on termite exterminators in Mesa. We would be happy to help keep you safe and your home preventable from getting any more termites. If you have any questions of concerns, please call us and we will provide you with all the information you need. We’re here to help!